Unfortunately, rather than use his knowledge to adhere to its provisions, the president has chosen to test the boundaries of our government’s founding document. 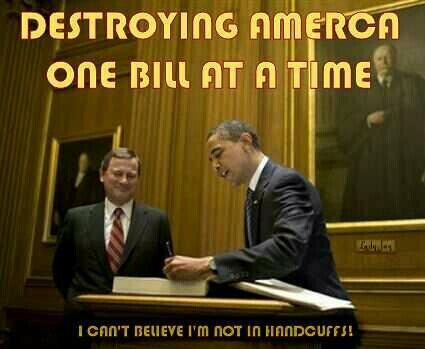 But not only has Obama been derelict in his duty to protect our laws, he’s an offender. As Democrats are so fond of reminding Republicans, Obamacare is now the law of the land. But despite the fact The Patient Protection and Affordable Care Act was indeed signed into law in 2010 and ultimately upheld by the Supreme Court, President Obama believes it’s within his power to make changes without Congressional action! Our Constitution clearly grants legislative powers to Congress. The president does not have the authority to arbitrarily “alter” legislation signed into law. The employer mandate, which requires businesses employing 50 or more full-time employees to provide health insurance or pay a fine, was scheduled to take effect in 2014, but has been delayed entirely or in part, twice, by the president! The fact that Obamacare is poor legislation doesn’t grant the president powers exceeding those afforded him by the Constitution. And in the first case of its kind, the Supreme Court is now arguing the legality of four “recess” appointments made by President Obama to the National Labor Relations Board (NLRB) and the Consumer Financial Protection Bureau in 2012. The Constitution allows the president to make temporary appointments to those positions that otherwise require Senate confirmation, but only when the Senate is in recess. The problem is — the Senate was not in recess! Three federal appeals courts have already ruled that Obama overstepped his authority in these appointments. It’s obvious the president is following the “executive version” of the liberal playbook which calls for continuous contestation of preconceived limitations designed to “progressively” tilt the scales of totalitarian power to the left. President Obama is arguably the most liberal president in our nation’s history. If he’s successful in these attempts to bypass our nation’s laws, what leftist policies will he pursue in his remaining years in office? The U.S. Constitution is not merely a guideline to be consulted by those it was written to regulate. It’s the supreme law of the land written to protect the rights of all Americans and must be protected. It’s time Americans “tether” President Obama to the Constitution and hold him accountable for adhering to its precepts. This president is not above the law. Mark Caserta is a Cabell County resident and a regular contributor to The Herald-Dispatch editorial page.